SAN BERNARDINO, Calif., February 20, 2019 – BNSF Railway Company (BNSF) today announced that its 2019 capital expenditure program in California will be approximately $245 million. This year’s plan in California includes several scheduled maintenance and capacity expansion projects to ensure BNSF continues to operate a safe and reliable rail network. 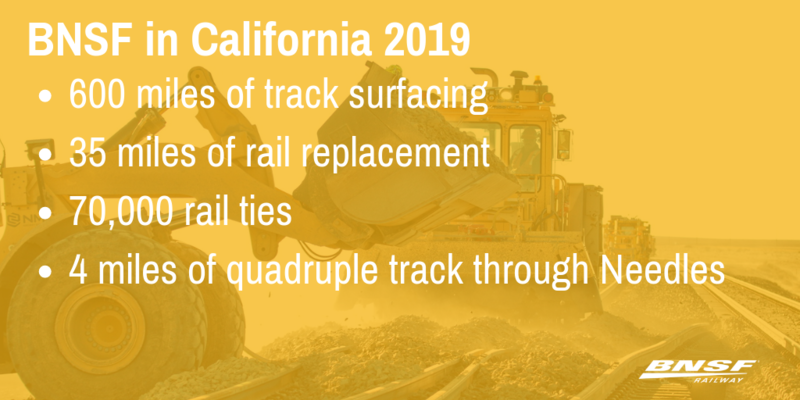 The 2019 maintenance program in California includes more than 600 miles of track surfacing and/or undercutting work as well as the replacement of approximately 35 miles of rail and close to 70,000 ties. Since 2014, BNSF has invested more than $1 billion to expand and maintain its network in California. In 2019, BNSF will continue enhancing capacity through the city of Needles by adding approximately four miles of quadruple main track. In support of volume growth in Southern California, BNSF plans to develop incremental lift capacity at Barstow by constructing new production tracks and parking stalls, as well as acquiring lift equipment.